Mary Betty Douglass passed away on November 3, 2013, at the age of 87. She was known to Minnesota children as Miss Betty on television’s Romper Room on WTCN, channel 11, and later KMSP, channel 9. 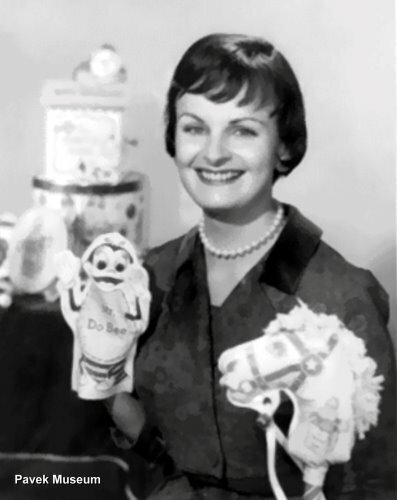 Throughout the 1960’s, she taught kids to “do be a Do-Bee and don’t be a Don’t-Bee.” She would gaze into her “Magic Mirror” and call out the names of viewers. After leaving Romper Room, Mary Douglass was a real estate agent with the Frank Krieser Real Estate agency. In 2009, she appeared at the Hi Kids: A Retrospective of Twin Cities Children’s TV at the Heights Theater in Minneapolis. She shared her stories of hosting Romper Room and presented the few surviving film clips of her program. Highlights of that event are available on DVD from the Pavek Museum of Broadcasting. Mary Betty Douglass is survived by her daughters Madeline Douglass and Pamela Hastings and two grandsons, Jay and Alex Hastings. Tributes can be sent to the Wedum Compassion Fund of the Allina Hospice Foundation through their website at https://donate.allina.com. Miss Betty was my teacher when I was on Romper Room; I think it was 1966 or ’67. I still remember how excited I was when she said my name in the Magic Mirror and how shocked I was when I saw her light a cigarette while she was standing at her big desk! I remember how cool it was driving the milk truck. One of the questions she asked us was to name a reason our mom got mad at us and I said “when I forget to flush the toilet” – oh boy did I get chewed out when I got home that day. She was a very sweet and lovely lady. I’ll never forget my very first teacher, Miss Betty.